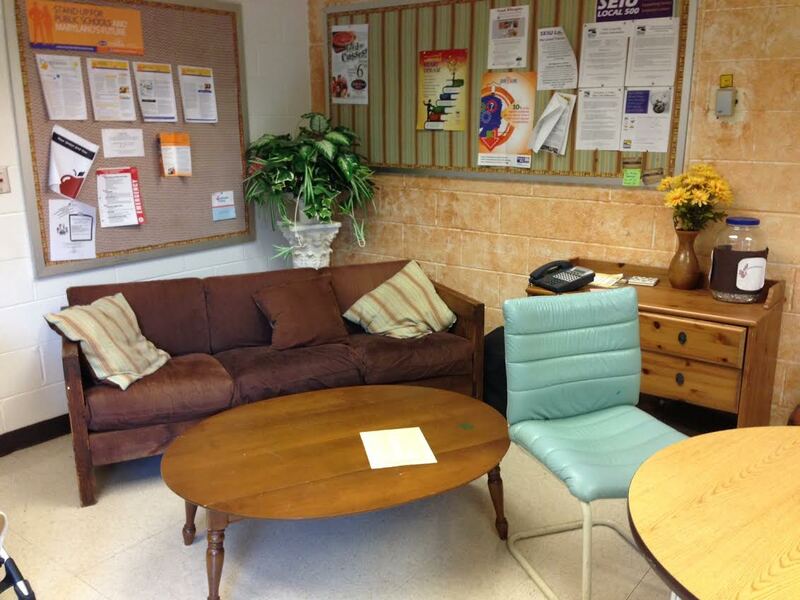 You are here: Home / Furniture Makeovers / Chairs / BEFORE & AFTER: Jen’s Teacher’s Lounge Retreat! 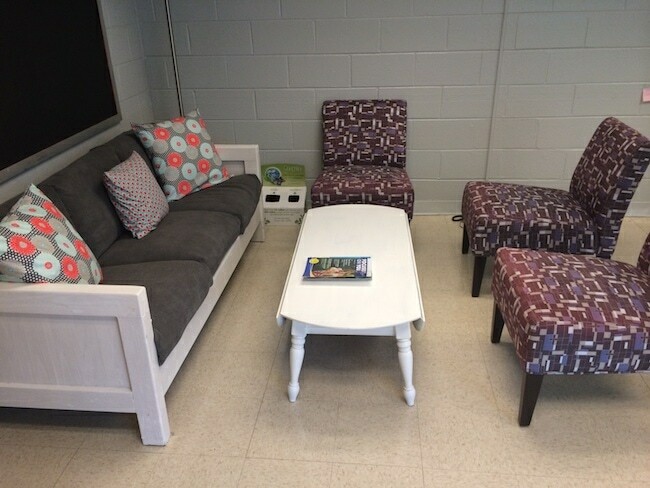 Back in mid-July an email went out to the PTA, asking for parents to help transform a few of the teacher’s transform the teacher’s lounge. Being the DIYer that I am, of cooouuurrse I’ll help! :). It just so happy to coincide nicely with the August Upgrade challenge. 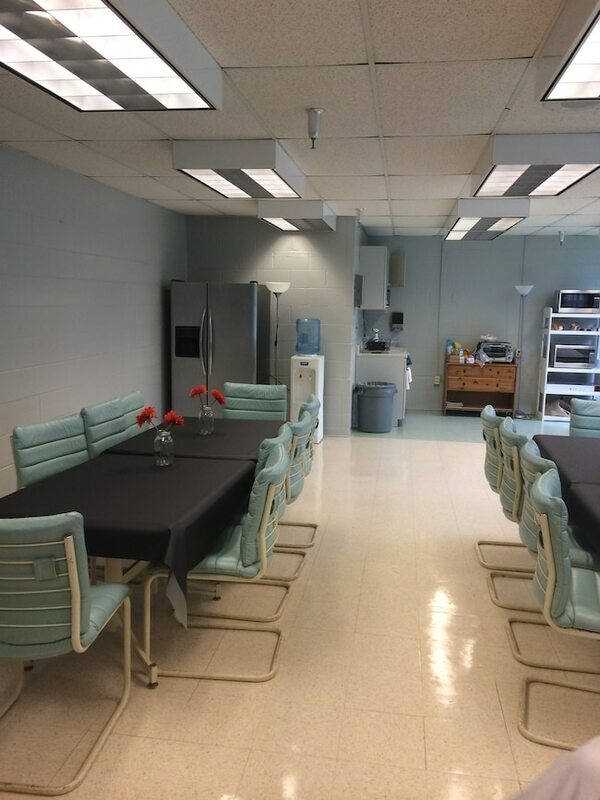 This is what the teacher’s lounge looked like before Jen, Edie (the new Physical Education teacher), the parents, and me, got our hands on it! 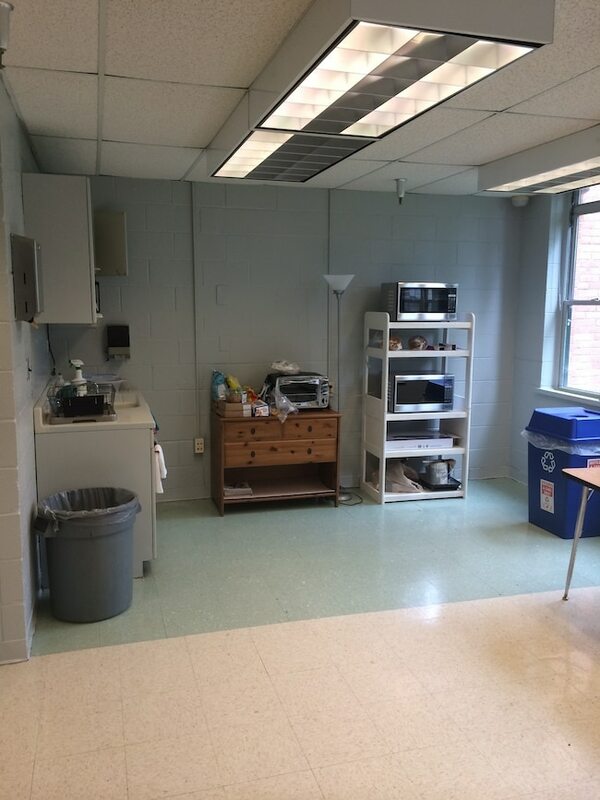 It really was a sad sort of teacher’s lounge. 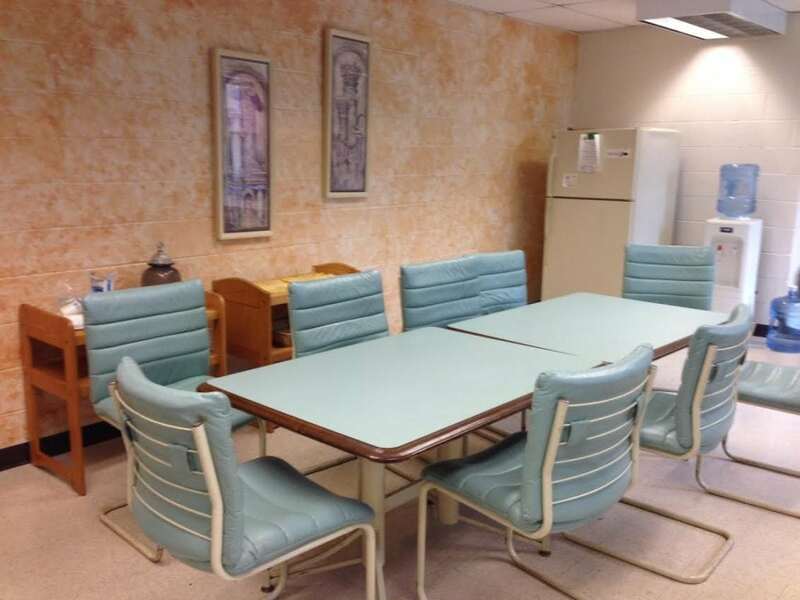 Everything was outdated and a bit dingy, and I hated to think that these awesome teachers didn’t have somewhere nicer to relax during lunch. But after we were through with it, it turned out amazing!! 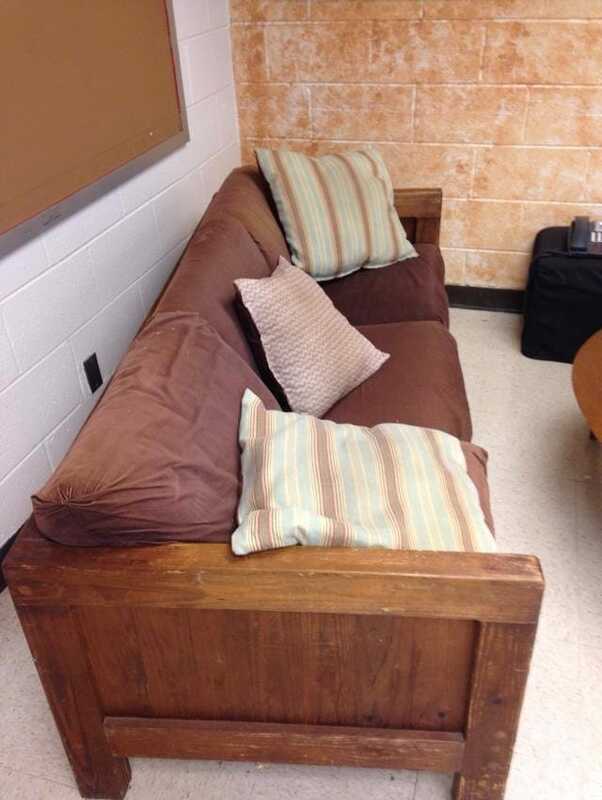 You couldn’t imagine your kid’s teacher sitting on a sofa like this, could you? I couldn’t either. 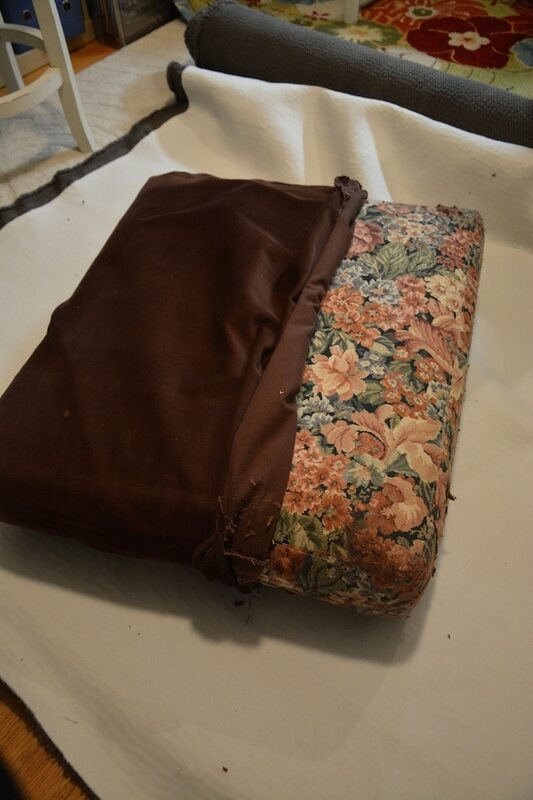 So when they asked me to make over the sofa, I couldn’t wait to get my hands on it! 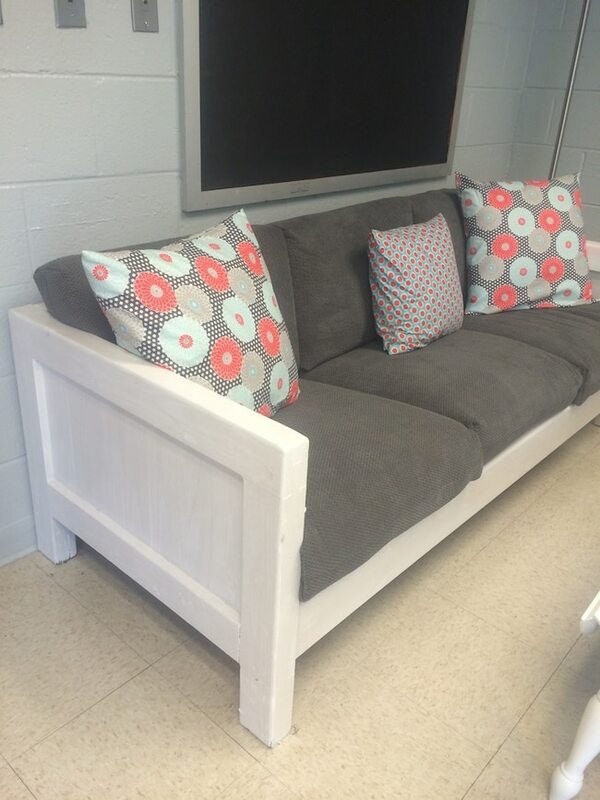 I painted the sofa white and reupholstered the cushions, and another parent, I believe, completed the pillows. 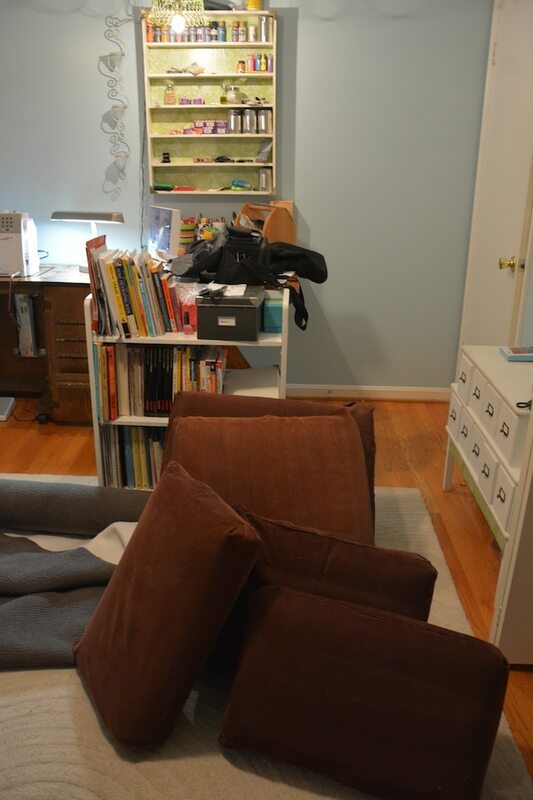 But I stacked them all up in my craft room and got started on reupholstering them! These tables were outdated. However, the chairs were super comfy and people didn’t want to get rid of them (or have time to DIY them at this time). 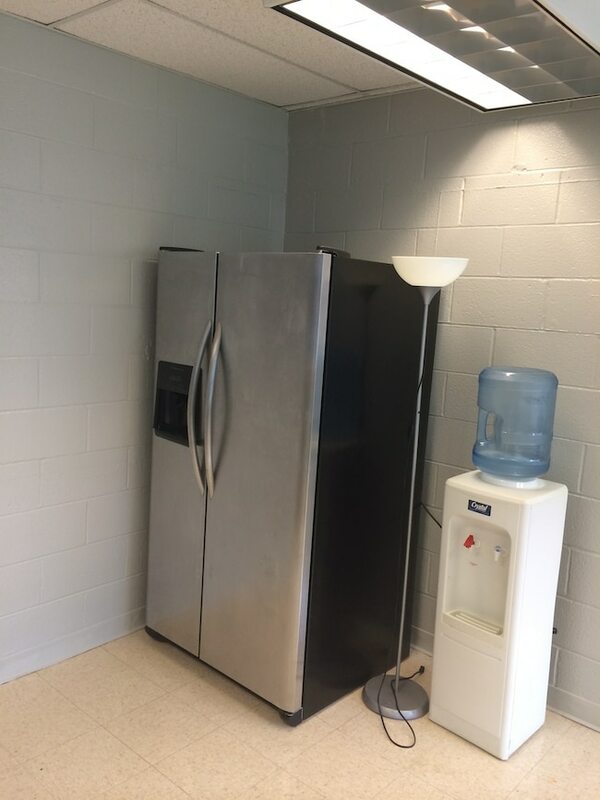 A new fridge was donated to them, too! 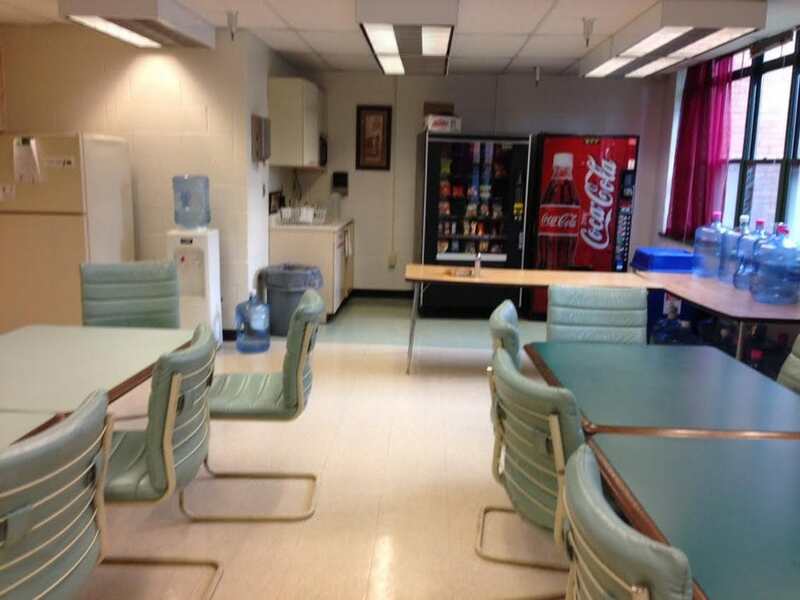 The soda machines were moved to the other side of the room. And the windows are getting window treatments that will match the cushions on the sofa, but they weren’t done at the time of these pics :). 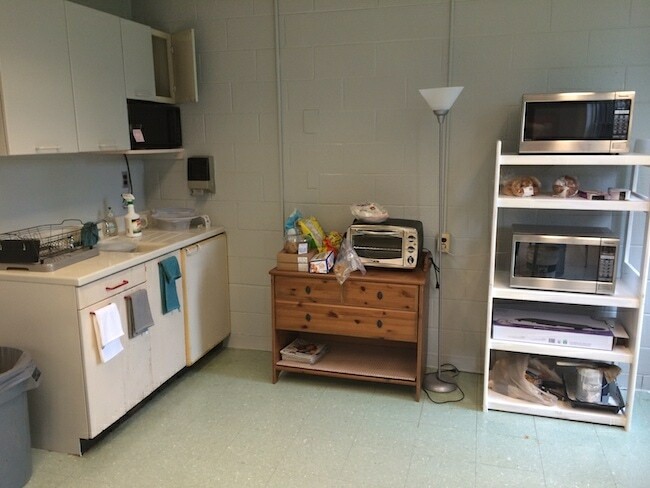 This kitchenette is going bye-bye. You know how the school district can be. Things take time. But they have a carpenter coming to install a new one! YAY! When my son saw it during Open House, he loved it. He’s such a silly boy…. The staff were soooooo appreciative of me helping out with the sofa. But really, I enjoy this stuff! I didn’t mind helping at all. Plus, this is my son’s school. These are the teachers that are spending each and every day with my son. Being a teacher isn’t easy. 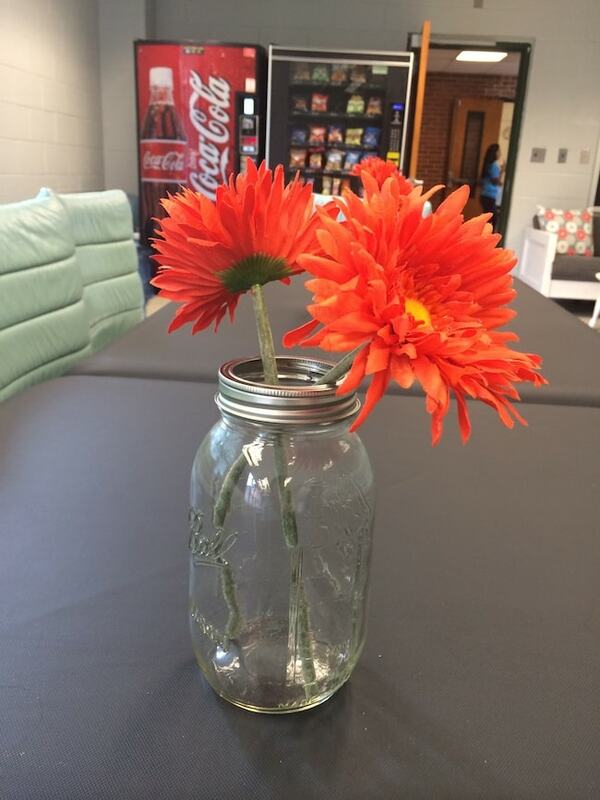 They deserve a pretty place to relax and that feels “homey”! So what do you think of this makeover? 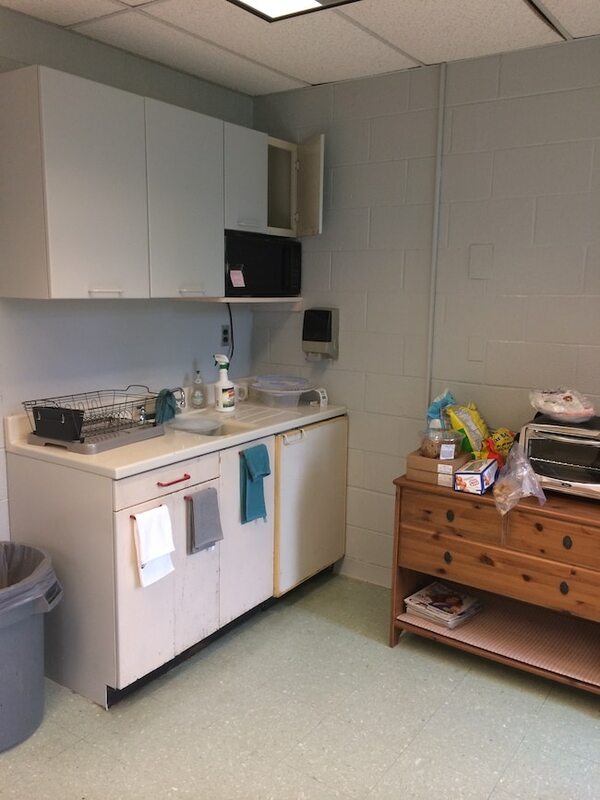 I can’t wait to see the finished finished product after the kitchenette is installed. But this go-around, I would say it was a success! See the Rest of the 30-Day August Upgrade Room Makeovers HERE! Join the Next Room Challenge! 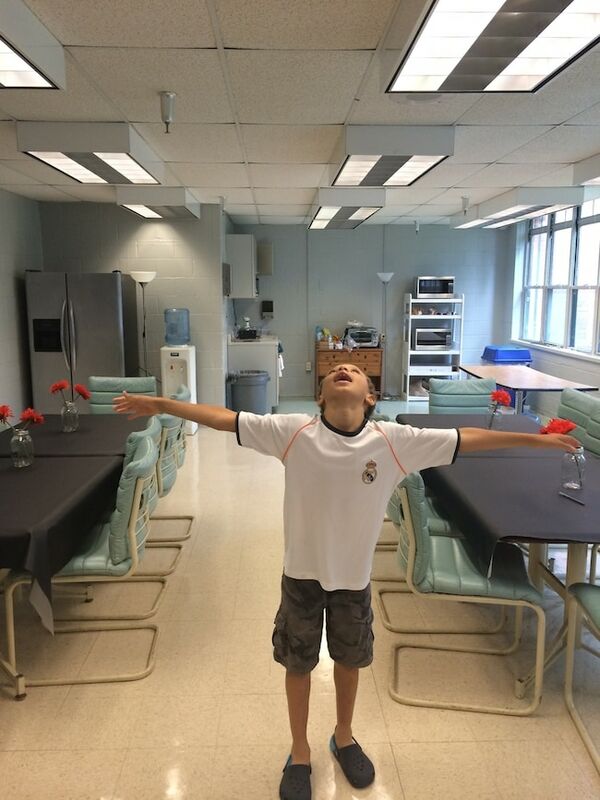 « BEFORE & AFTER: Alex’s Darling Dining Room!